Home Bits of Torah Truth Bits of Torah Truths, פרשת וישלח, Parashat Vayishlach, The Merit of Others? 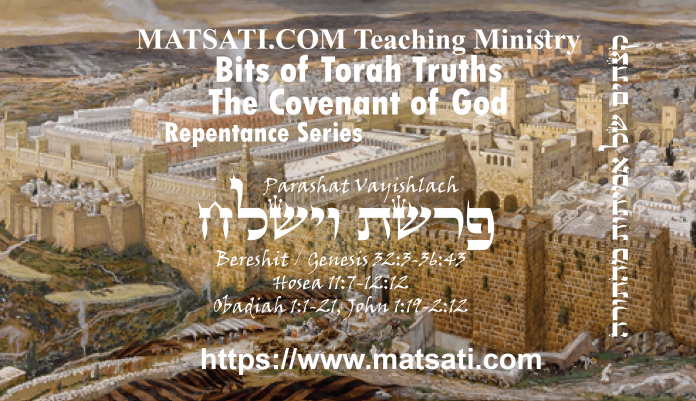 Bits of Torah Truths, פרשת וישלח, Parashat Vayishlach, The Merit of Others? In Parashat Vayishlach, Jacob prays to the Lord for his safety saying the following, וַיֹּאמֶר֮ יַעֲקֹב֒ אֱלֹהֵי֙ אָבִ֣י אַבְרָהָ֔ם וֵאלֹהֵ֖י אָבִ֣י יִצְחָ֑ק יְהוָ֞ה הָאֹמֵ֣ר אֵלַ֗י שׁ֧וּב לְאַרְצְךָ֛ וּלְמוֹלַדְתְּךָ֖ וְאֵיטִ֥יבָה עִמָּֽךְ׃ 32:10 Then Jacob said, “O God of my father Abraham and God of my father Isaac, O LORD, who said to me, ‘Return to your native land and I will deal bountifully with you’! קָטֹ֜נְתִּי מִכֹּ֤ל הַחֲסָדִים֙ וּמִכָּל־הָ֣אֱמֶ֔ת אֲשֶׁ֥ר עָשִׂ֖יתָ אֶת־עַבְדֶּ֑ךָ כִּ֣י בְמַקְלִ֗י עָבַ֙רְתִּי֙ אֶת־הַיַּרְדֵּ֣ן הַזֶּ֔ה וְעַתָּ֥ה הָיִ֖יתִי לִשְׁנֵ֥י מַחֲנֽוֹת׃ 32:11 I am unworthy of all the kindness that You have so steadfastly shown Your servant: with my staff alone I crossed this Jordan, and now I have become two camps. Jacob declares the goodness of God in His blessing him to have a family and many children. Rashbam on Bereshit / Genesis 32:11 Part 2 states, “החסדים, the loving kindness as expressed by promises. We have a parallel to this in 1 Kings 8:64. Seeing that You have performed for me both חסדים and אמת, although I have not yet redeemed my vow to establish an altar at Beyt El and to sacrifice to You there, I am now afraid in spite of the assurances You have given me. I am aware that You do not judge man according to his good intentions but according to his carrying out such intentions, and I have been remiss in this respect.” The point is that the Lord does not look at our intentions, but at what we do with those intentions. The Lord shows us grace (חסדים) and truth (אמת) for the purpose of allowing us to work out those intentions in the practice of our faithfulness before Him. The example given by Rashbam was Hezekiah the king of Judah (1 Kings 20:1) the prophet told him he was going to die, and he prayed and the Lord granted him 15 more years to live. The extension on life was coupled with his merits, and his intentions and what he had done with those intentions for the good of the Lord and for the good of his people. What this teaches us is when we pray, we should recognize and acknowledge our own inadequacies, and proclaim the power of the One who we are praying to, the Lord God in heaven. Jacob made this point saying that he was unworthy of all the kindness (grace, חסדים) the Lord had shown him up until this day. This is also what King David did in Tehillim / Psalms 16:2 when he said אתה טובתי בל -עליך, “You are my Lord, my benefactor; there is none above You.” He was saying that his experience of the Lord’s kindness had convinced him that there is no one equal to Him as a master. When speaking on the merits of our righteous works, there are seven areas in which a person must rely upon the Lord. These are (i) in matters of one’s own body, (ii) regarding his ability to earn a living, (iii) in interpersonal relationships with family, friends, enemies, and others, (iv) regarding duties of the heart and limbs that only affect the person himself, (v) regarding duties of the limbs that affect others as well, (vi) pertaining to one’s reward in the Olam Haba (World to Come) according to what one has done in this life, (vii) regarding one’s reward in the Olam Haba that he receives strictly as a matter of God’s mercy (grace, חסדים), as per Tehillim / Psalms 31:20, “How abundant is Your goodness, which You have put aside for those who fear You, that You have wrought for those who take their refuge in You, in the sight of mankind!” A person’s own body includes not just one’s life and his health but also such necessary things as food, clothing and shelter. The proper way to rely upon God in this area is to just let go and accept the course that God has set forth for each of us. When we have this understanding that the Lord God is in control, it is then that we pursue what He desires for our lives, secure in the knowledge that the Lord will succeed in His plan that He has made. For example, the Lord God has determined the length of a person’s life, this does not presuppose a person does not need food to eat, clothes to wear and a place to sleep. Therefore, one may not say, “If God wants me to live, He’ll enable me to survive without food, so I’ll never need to work.” The blessing of God comes in the context of our ability to work (see Devarim / Deuteronomy 18). Trusting in the Lord comes with great patience in the most trying of circumstances, considering everything as falling within the will of God. Our merits are coupled to our perseverance to walk with God in the midst of trials and tribulations, and this comes only by the help of the Lord in Heaven and His presence in our lives. This is what Jacob was expressing in His prayer to the Lord for His protection against His brother.